We serve customers in Saskatchewan, Alberta, Manitoba, B.C. and the Northern U.S.A. hauling bulk commodities. Our modern and well-maintained equipment minimizes downtime and maximizes driver and customer satisfaction! 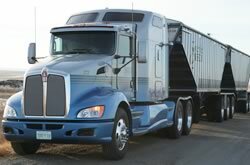 We run a modern fleet of highway tractors and well-maintained and clean super-B trailers. If you would like to find out how Somerville Farms (2014) Ltd. can help you with your transportation needs, please give us a call today.